Treasures of Sailors' Snug Harbor is an exhibition of art and artifacts from the Collection of the Trustees of the Sailors' Snug Harbor in the City of New York. It consists of work from Sailors' Snug Harbor, the famous home for mariners on the Staten Island shore of the Kill van Kull. From 1831 until the facility moved to North Carolina in 1976, it amassed a noteworthy collection of fine art and artifacts in the many buildings and on the grounds of the 80-acre campus. The Sailors' Snug Harbor Trust remains in existence and continues to provide financial assistance to eligible mariners around the country. In 2010, the Trustees of the Sailors' Snug Harbor in the City of New York selected the Noble Maritime Collection as the steward of its collection and placed many works of art, furnishings, and artifacts on loan at the museum. Though the works of art graced the halls of the private facility for over 100 years, they had not been exhibited for the public. In addition to a 1894 impressive full-length, 5’ x 7’ portrait of Alexander Hamilton by Thomas Waterman Wood (1823-1903) after the original painting by John Trumbull (1756-1843), works of art range from large canvases such as Gustav Romin’s 6’ x 8’ oil, Fishing off the Coast; a 4’ x 7’ 19th Century American School oil called A View of Upper Bay, which features the Narrows and the Staten Island and Brooklyn shorelines; and H. Cassinelli’s The Shakespeare in a Storm, a 3.5’ x 4’ oil painting. 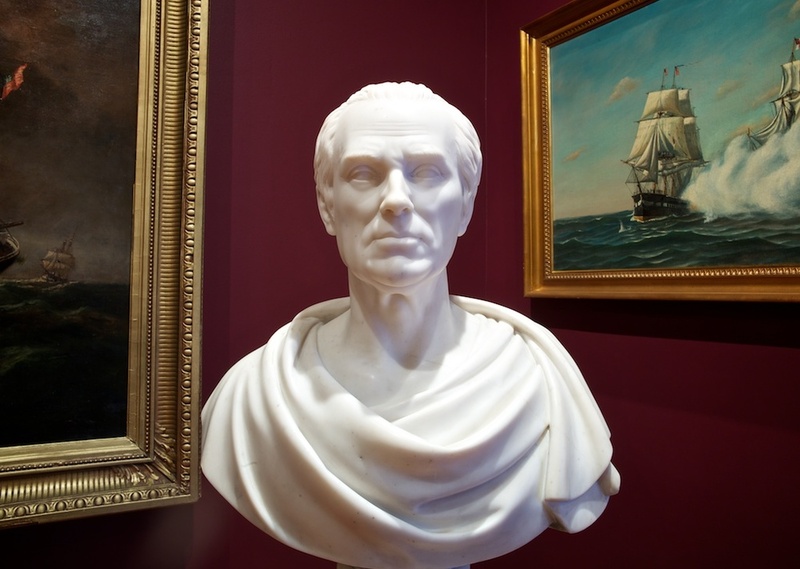 Robert Richard Randall died in 1801 and left his Manhattan estate, Minto Farm, to his trustees delegated to establish a home for “aged, decrepit, and worn-out seamen.” Several works that reflect the history of Sailors' Snug Harbor, such as the Marble Bust of Robert Richard Randall by Robert Eberhard Schmidt Von Der Launitz (1806-1870) and Randall’s cane, which he left to the overseer of his farm in Manhattan in his famous will, are on display. The stained glass transom window by John La Farge (1835-1910) that graced the first building on the site, Main Hall, which opened in 1831, is exhibited, as well as a Letter of Safe Passage signed by President Thomas Jefferson and Secretary of State James Madison in 1802. The Marine Society of the City of New York and the Trustees of the Noble Maritime Collection provided significant funding to conserve the works of art. The exhibition was also funded by the Staten Island Foundation, the Achelis and Bodman Foundations, the Trustees and members of the Noble Maritime Collection, and the New York City Department of Cultural Affairs in partnership with the City Council. The Noble Maritime Collection is greatly appreciative of the opportunity offered by the Trustees of the Sailors' Snug Harbor in the City of New York to publicly exhibit the historically significant art and artifacts in their collection.